Murder by Gaslight: How to Abolish Murder. 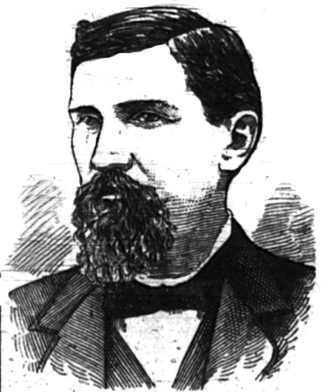 In 1869 H. H. Bingham, agent of the Michigan State Prison, issued a pamphlet analyzing the effect of Michigan’s abolition of the death penalty some twenty-two years earlier. In place of hanging, Michigan sentenced capital offenders to solitary imprisonment for life (though the longest anyone actually stayed in solitary confinement was five years). 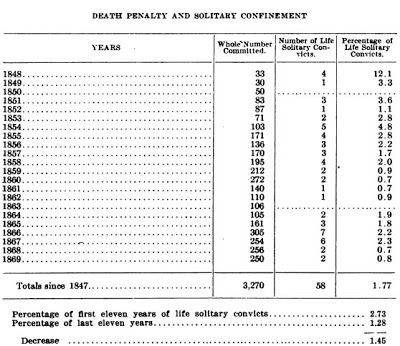 Bingham concluded that, though the number of criminal convictions in Michigan increased during that period “…there is no evidence in the increased convictions that there is an increase of crime beyond the ratio of increase in population.” In fact, the number of convicted murderers, as a percentage of total convictions, actually decreased. A correspondent writing from Michigan says the abolition of capital punishment in that State has diminished the murder rate. What an anomaly is human nature! Persons inclined to murder find that in Michigan they can not enjoy the privilege of being hanged for it; so they resolve they won’t play. Probably they go off to other States where hanging is allowed, to do their business. We presume that equally trustworthy statistics would show that murder has increased in the adjoining States since Michigan abolished Hanging. If this diminution of the terror of the penalty for murder has diminished murder in Michigan, it follows logically and morally that if she should abolish all penalties, murder would cease entirely in that State for want of encouragement. There are persons of equal intelligence of human nature who think that if the common people are permitted to see a public hanging, they will incontinently be seized with a propensity to go and murder somebody in order to play a star part in so attractive a spectacle. Collections of the Pioneer Society of the State of Michigan. Lansing: Wynkoop Hallenbeck Crawford Company, 1907. "How to Abolish Murder." Cincinnati Daily Gazette 15 Oct. 1875.